Washed ashore after a storm, you discover you have been transformed into a Pokemon. A thief has been stealing the legendary Time Gears, causing time to stand still. 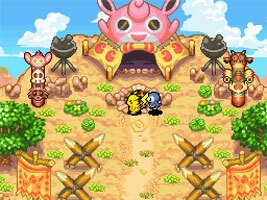 Team up with your Pokemon friends and complete missions for the Jigglypuff Guild. Head inside randomly-generated dungeons to find items and lost Pokemon, and restore the Time Gears to bring time back to normal. If you or your partner is defeated in a dungeon, you lose money and items and get sent back outside. You can also send an SOS to friends through local wireless or the Nintendo Wi-Fi Connection.